Transfer mixture to a large bowl; drizzle with vinegar and ¼ cup ice water. Mix with a fork, adding more ice water by the tablespoonful if needed, just until a shaggy dough comes together; lightly knead until no dry spots remain (do not overwork). Pat into a disk and wrap in plastic. Chill at least 2 hours. Preheat oven to 400°. Season ricotta with kosher salt and pepper; set aside. Heat 1 Tbsp. oil in a large skillet over medium-high heat. Add mushrooms; season with kosher salt and pepper and cook, stirring occasionally, until golden brown and crisp, about 5 minutes. Transfer to a small bowl. Heat 1 Tbsp. oil in same skillet over medium heat. Cook garlic, stirring, until fragrant, about 30 seconds. Add half of chard, season with kosher salt and pepper, and cook, tossing, until slightly wilted. Add remaining chard and cook, tossing occasionally, until completely wilted, about 4 minutes. Remove from heat; season with salt and pepper. Set aside. Roll out dough on a lightly floured sheet of parchment to a 14” round about ⅛” thick. Transfer on parchment to a baking sheet. Spread three-fourths of ricotta over dough, leaving a 1½” border. Top with reserved chard, then mushrooms. Dollop remaining ricotta over vegetables. Bring edges of dough up and over filling, overlapping as needed, to create a 1½” border; brush with egg. 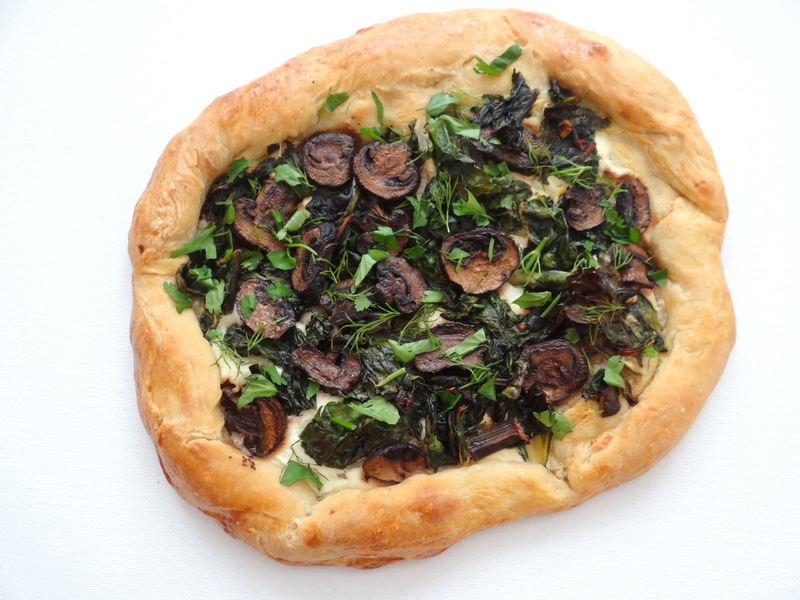 Bake galette, rotating once, until crust is golden brown and cooked through, 35–40 minutes. Let cool slightly on baking sheet. Toss herbs with lemon juice and remaining 1 Tbsp. oil in a small bowl; season with pepper. Top galette with herbs, zest, and sea salt. Yum! This looks great even though it didn’t look as pretty as it probably did in your head. Making dough isn’t too bad except for the part that requires some…rolling out, actually, making dough is kind of a pain, so yeah, buying it premade = saves you time.